Castlebar - County Mayo - Hurling on the Green is Back! Summer is here so what's more natural than Hurling on the Green? - Yes folks it's back! The coaching programme is designed to suit all age groups from six- to 12-year-olds. 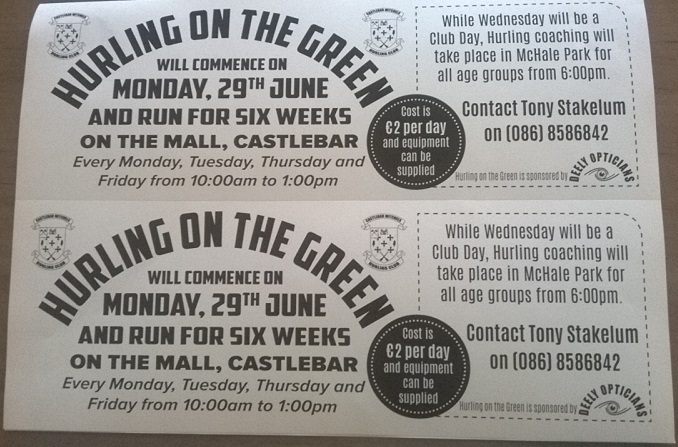 Hurling on the Green will commence on Monday 29th JUNE and run for six weeks on The Mall, Castlebar, every Monday, Tuesday and Thursday Friday from 10:00am to 1:00pm, while Wednesday will be a Club day and Hurling coaching will take place in Mc Hale Park for all age groups at 7:00pm.